I haven’t had time to watch television lately. I’ve been focusing on writing and editing (for myself and for others), which means working with the TV off until the work is finished. It’s my rule. This process repeats until the weekend rolls around. Last Saturday, I watched a show a lot of people have been talking about, Unbreakable Kimmy Schmidt. It was smart, entertaining, and well-executed. Parts of it were funny, but not hilarious. Still, the show got me thinking and drawing connections to my writing life (as all writers do). Throughout the show, Kimmy proves she is wise beyond her years—mostly due to her captivity in an underground bunker (I can’t even begin to explain that in this post, so just go watch it). One of her most profound ideas crops up in the second episode of season one, “Kimmy Gets a Job.” In the episode, she has to throw a party to impress her new employer. When her employer’s child complains about having to wait to open his presents, she assures him that he’ll be able to wait. That scene got me thinking. For me, one of the hardest parts of writing is just getting started. It’s sitting down and making the commitment to get the words down. It’s the ability to push past this mental block and write that separates the wannabe writers from the professionals. It’s not enough to want to write—you must actually produce something. 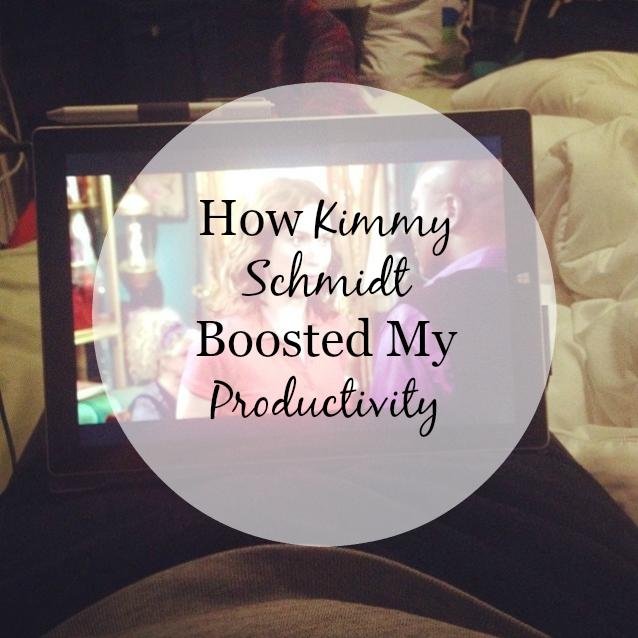 Kimmy Schmidt reminded me that a task is easier to accomplish when it has a definite end. I applied this idea to my writing life by setting a timer for ten minutes, rather than ten seconds. Ten minutes isn’t long at all. I sat down in my chair and told myself I only had to write until the timer went off. If I felt tapped out, I didn’t have to go on—the only rule was that I couldn’t stop until I heard the ding. It’s been twenty minutes now, and I’m still writing this blog post. It took me forever to get started until I thought of Kimmy Schmidt. The next time you can’t bring yourself to sit down and start writer, set a timer and go. You don’t need to write something perfect, but you need to write something. How else can you expect to make a living as a writer? The key to success in the craft is production. You can stand almost anything for ten minutes, darling. Go ahead and take it ten minutes at a time. What do you think about this advice? How do you get started when you don’t feel like writing?